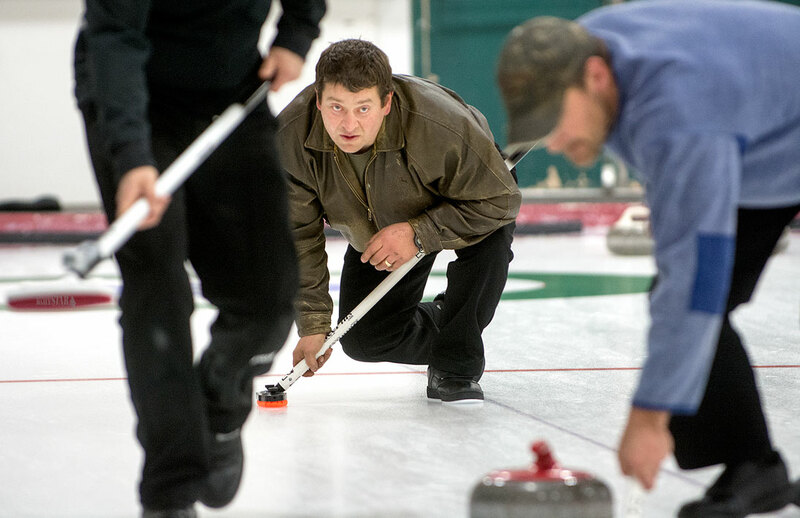 FINAL TUNE-UP – Bob Smallwood watches the line after releasing a shot during a men’s league game Tuesday night at the Whitehorse Curling Club. Smallwood will once again lead the territory at the Canadian Mixed Curling Championship next week. Bob Smallwood hopes to pick up right where he left off last season. For the third straight year, the 41-year-old Yukon skip will lead the territory into the 2016 Canadian Mixed Curling Championship, which begins Sunday at the Weston Golf and Country Club in Toronto. The event will run until Nov. 14. Yukon’s roster is identical to last year’s rink, which finished with a 5-4 record in North Bay, Ont. Smallwood will once again be joined by third Nicole Baldwin, second Wade Scoffin and lead Jody Smallwood – his wife. In 2013, Smallwood’s Yukon rink was eliminated from the mixed nationals in the preliminary round in Ottawa. That portion of the event has since been eliminated. The 53rd edition of the mixed national championship will feature the full slate of 14 teams, separated into two pools. Yukon will face each of the Northwest Territories, Quebec, Nunavut, Ontario, New Brunswick and Manitoba in round robin play. The championship and seeding rounds will begin Thursday, with the top four teams in each pool vying for the Canadian title. The tiebreaking formula will use head-to-head results followed by accumulated draw shot results. The winning team will represent the nation at the 2016 World Mixed Curling Championship, next Oct. 15 to 22 in Kazan, Russia. Meanwhile, next year’s mixed nationals will be held in Yarmouth, N.S. Last season, Smallwood put together an impressive string of local tournament victories, including mixed nationals and mixed doubles. He also represented the territory alongside Scoffin at the Brier. Smallwood will be one of eight skips at the mixed nationals with Brier experience. The skip could not be reached by the Star before press time today.